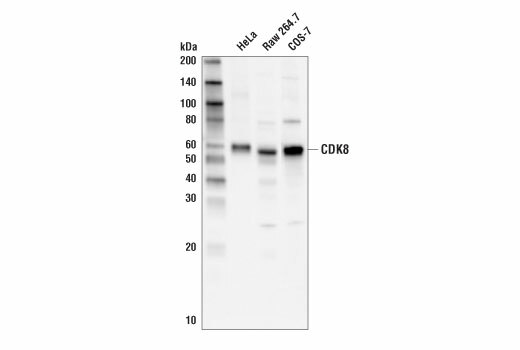 Background: CDK-activating kinase (CAK) is a complex of CDK7 and cyclin H. The complex is involved in cell cycle regulation by phosphorylating an activating residue in the T-loop domain of cdks (1). Regulation of CAK activity is mediated by T-loop phosphorylation and by association with MAT1, both of which enhance its kinase activity toward the CTD of RNA polymerase II (2,3) and other substrates such as p53 (4). CAK is an essential component of the transcription complex TFIIH and may interact directly with TFIIH helicases (5). Background: The mammalian Mediator Complex is a multi-subunit protein complex that couples specific transcriptional regulators to RNA polymerase II (Pol II) and the basal transcription machinery. Interactions between distinct Mediator subunits and transcription factors allow for specific gene regulation (reviewed in 1).Mediator complex interactions control various biological processes, including insulin signaling (2), NF-κB-dependent signaling (3), stem cell pluripotency and self renewal (4,5), and proliferation of colon cancer cells (6,7).CDK8/Cyclin C, along with Med12 and Med13, constitute a subcomplex within the Mediator Complex thought to act as a molecular switch, inhibiting Pol II recruitment and transcription initiation (8,9). Expression of CDK8 abrogates E2F-1-dependent inhibition of β-catenin activity in colon cancer cells (9). 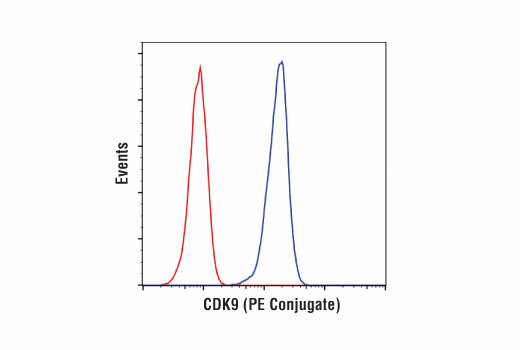 High levels of CDK8 coincide with high β-catenin-dependent transcription in colon cancer cells, and their proliferation can be inhibited by suppressing CDK8 expression (8).CDK8 can phosphorylate Ser727 on STAT1, which reduces natural killer (NK) cell toxicity (10,11). As such, inhibitors are being pursued as potential therapeutics to enhance NK cell activity and combat a variety of cancer types (12,13). 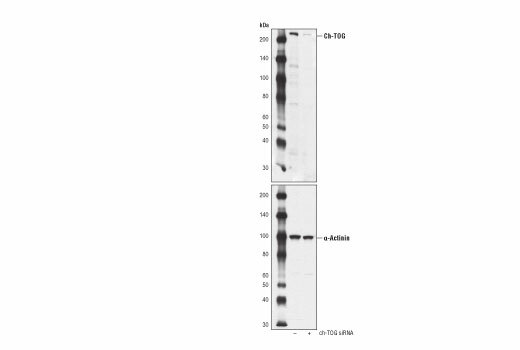 This Cell Signaling Technology antibody is conjugated to phycoerythrin (PE) and tested in-house for direct flow cytometry analysis in human cells. 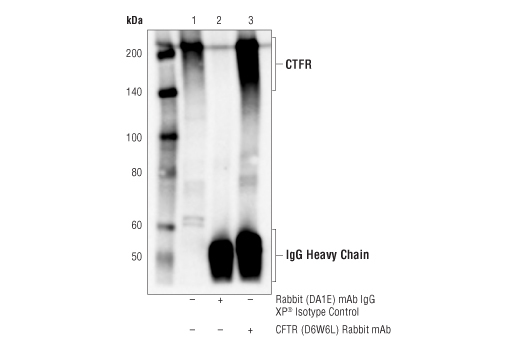 This antibody is expected to exhibit the same species cross-reactivity as the unconjugated CDK9 (C12F7) Rabbit mAb #2316. Background: P-TEFb is a general transcription factor that regulates transcription elongation through phosphorylation of the C-terminal tail domain (CTD) of RNA polymerase II (RNAP II). The P-TEFb complex is composed of a catalytic subunit, CDK9, and its regulatory cyclin partner, which can be cyclin T1, T2a, T2b or K (reviewed in 1,2). P-TEFb is recruited by the HIV Tat protein to allow transcriptional elongation, and subsequent replication of the viral genome. Inhibition of P-TEFb function therefore has potential for HIV therapy. 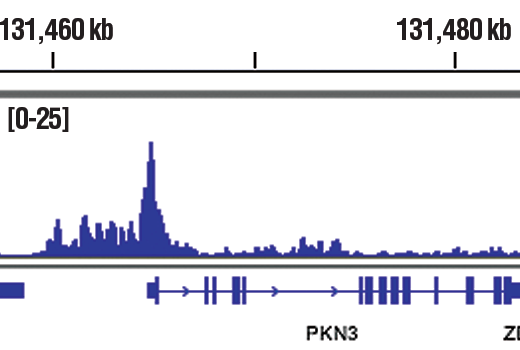 CDK9 exists as two isoforms, an abundant 42 kDa isoform, and a less abundant 55 kDa isoform, which contains an amino-terminal extension (3). The two forms likely have distinct purposes based on differential expression during lymphocyte activation (4,5) and on their localization within the nucleus (5).Cyclin dependent kinases (CDKs) are activated in part by cyclin binding and by phosphorylation of a conserved threonine in the T-loop domain. Phosphorylation of CDK9 at the T-loop Thr186 by an unidentified nuclear kinase may be important in P-TEFb activation (6) and regulation of HIV transcription (7). Acetylation of CDK9 at Lys44 affects its ability to phosphorylate the RNAPII CTD (8). Background: The initiation of DNA replication in mammalian cells is a highly coordinated process that ensures duplication of the genome only once per cell division cycle. Origins of replication are dispersed throughout the genome, and their activities are regulated via the sequential binding of prereplication and replication factors. The origin recognition complex (ORC) is thought to be bound to chromatin throughout the cell cycle (1,2). The prereplication complex (Pre-RC) forms in late mitosis/early G1 phase beginning with the binding of CDT1 and cdc6 to the origin, which allows binding of the heterohexameric MCM2-7 complex. The MCM complex is thought to be the replicative helicase, and formation of the pre-RC is referred to as chromatin licensing. Subsequent initiation of DNA replication requires the activation of the S-phase promoting kinases CDK2 and cdc7. Cdc7, which is active only in complex with its regulatory subunit dbf4, phosphorylates MCM proteins bound to chromatin and allows binding of the replication factor cdc45 and DNA polymerase (3,4).Binding of CDT1 to geminin prevents pre-RC formation, and expression and degradation of geminin serve to regulate CDT1 activity (reviewed in 5). The interaction of CDT1 with MCM proteins is important in pre-RC formation and licensing (6,7). Both cdc6 and CDT1 are degraded by the ubiquitin proteasome pathway in response to DNA damage associated with rereplication (8). 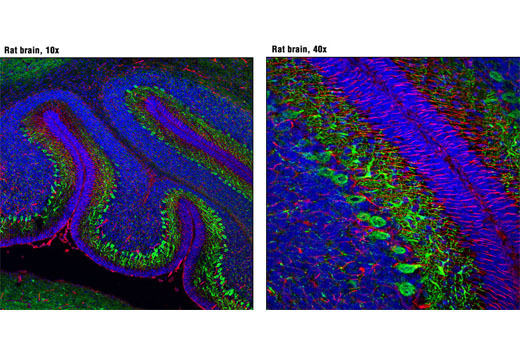 Background: CDX2, a homeobox domain-containing transcription factor, is a master regulator of the trophoectoderm, the layer that gives rise to extra-embryonic tissues in mammalian development (1). 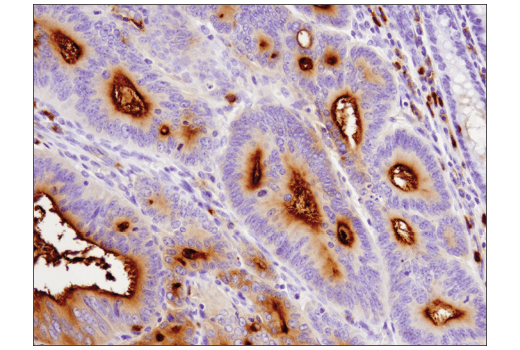 CDX2 is also involved in intestinal development (2), and gain of expression or loss of expression has been associated with various human malignancies such as Barret Esophagus (3) and colorectal cancer (4,5). Mouse embryonic stem cells deficient in CDX2 display limited hematopoietic progenitor development and altered Hox gene expression (6), pointing to a role for CDX2 in Hox gene regulation. 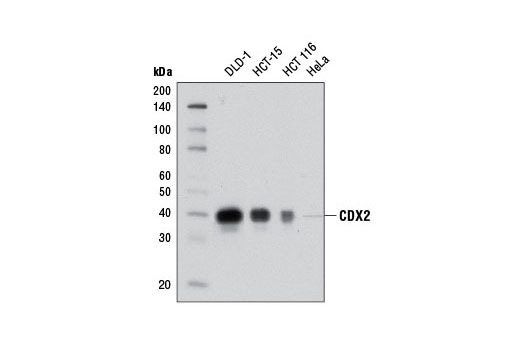 CDX2 is also implicated in the aberrant expression of Hox genes in human AML cell lines (7). 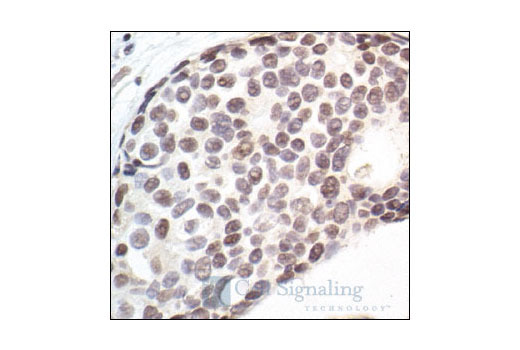 Background: Carcinoembryonic antigen (CEA), also known as CD66e or CEACAM5, is a 180-200 kDa cell surface glycoprotein whose expression is elevated in intestinal carcinomas and other tumors. CEA mediates cell adhesion, though little more is known about its biological activity. Expression of CEA is correlated with tumerogenicity (1), and it has been shown to play a role in cell migration, adhesion and invasion in culture cells, as well as in metastasis in vivo (2). Background: CEACAM1 (also known as C-CAM and CD66a) is a member of CEA-related cell-adhesion molecule (CEACAM) subfamily of the carcinoembryonic antigen (CEA) family (1). 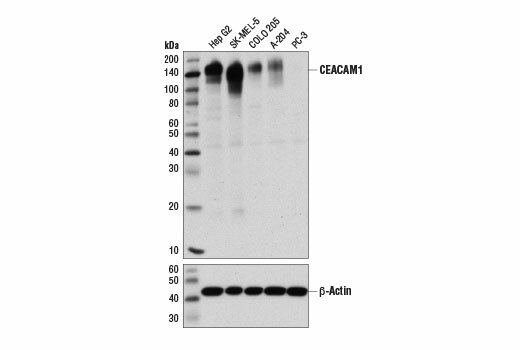 CEACAM1 is expressed by certain epithelial, endothelial, lymphoid, and myeloid cells. Human CEACAM1 has many different splice variants; the abundance of CEACAM1 and the relative ratio of the different isoforms varies markedly among cell types and may be regulated in a context-dependent fashion. The isoforms with long (L) and short (S) cytoplasmic tails have different signaling properties. Notably, L isoforms contain a functional ITIM (immunoreceptor tyrosine-based inhibitory motif) and several serine and threonine residues that could serve as potential phosphorylation targets. 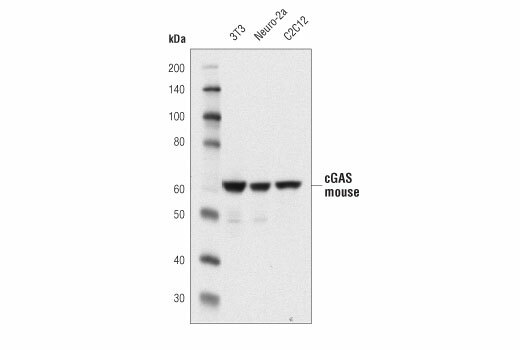 The extracellular domain of CEACAM1 is heavily glycosylated, making its apparent molecular weight during electrophoresis much larger than its predicted size (57.6 kDa) (2). CEACAM1 mediates intercellular adhesion through homo- and heterophilic interaction with other members of the CEACAM family. Studies indicate that CEACAM1 plays important roles in angiogenesis, neovascularization, insulin signaling, T cell signaling, and tumorigenesis (3-8). 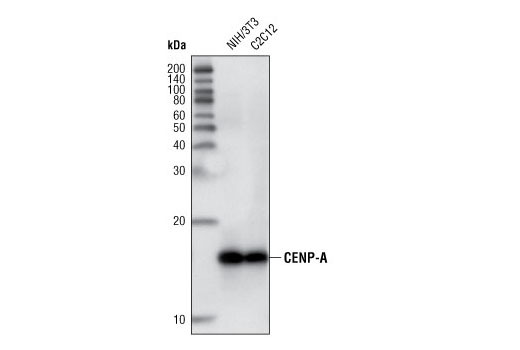 In addition, CEACAM1 can function as a receptor for several microbial pathogens (9,10). Background: Carcinoembryonic antigen-related cell adhesion molecule 8 (CEACAM8), also known as CD66b, is a member of the CEA-related cell-adhesion molecule (CEACAM) family (1). CEACAMs bind to themselves and other family members to carry out numerous cellular functions, including proliferation, signaling, differentiation, tumor suppression, and survival (2). 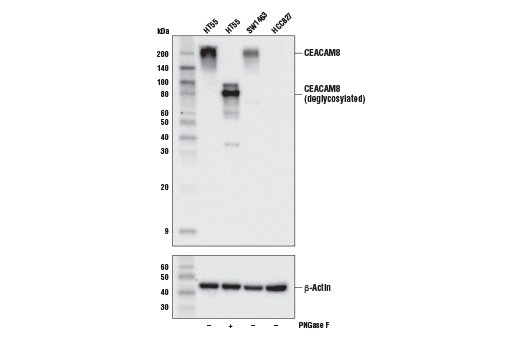 CEACAM8 is a single-chain, glycosylphosphatidylinositol (GPI)-anchored, highly glycosylated protein that under normal conditions is expressed almost exclusively on granulocytes (3). Heterophilic interactions of CEACAM8 with other surface molecules, such as CEACAM6, have been shown to be involved in regulating cell adhesion in a calcium-independent manner (4). As such, CEACAM8 has demonstrated utility as a marker of neutrophil and eosinophil activation (5,6) and in pathological conditions is shown to be highly expressed in primary myelofibrosis and acute lymphoblastic leukemias (7,8). Assessment of CEACAM8 positive tumor-infiltrating neutrophils has demonstrated value as a prognostic factor in multiple cancer types (9,10). Background: CELSR2 (cadherin EGF LAG seven-pass G-type receptor, also known as flamingo homolog 3 or epidermal growth factor-like protein 2) is a member of the flamingo subfamily of non-classical cadherins, part of the cadherin superfamily. CELSR2 is a 7-transmembrane helix receptor that contains nine cadherin-like domains, seven EGF-like repeats, and 2 laminin A G-type repeats (1). It shares structural characteristics of both an adhesion molecule and a G protein-coupled receptor, suggesting putatives roles in both cell-cell adhesion and juxtacrine signaling. It's function has been associated with dendrite morphogenesis (2), neural plate anterior-posterior pattern formation (3), and regulation of transcription via the Wnt signaling pathway (4). In a loss-of-function mouse model, Celsr2 deletion resulted in defects in the planar organization of ependymal cilia, leading to defective cerebrospinal fluid dynamics and hydrocephalus (5). In humans, SNPs in the CELSR2 gene cluster on chromosome 1 have been associated with enhanced risk of coronary artery disease (6). Background: The progression of progenitor cells towards neuronal differentiation is regulated by cell cycle control and the transition from proliferative to neurogenic cell divisions. Cell cycle exit and neuronal differentiation 1 (CEND1) is a neuronal protein widely expressed in the adult nervous system (1). It is implicated in the synchronization of cell cycle exit and differentiation of neuronal precursors in the developing nervous system, and its expression marks the exit of proliferative cells from the cell cycle (2,3). Levels of CEND1 expression in the subventricular zone of the adult nervous system are critical for cell cycle control and neuronal differentiation mechanisms during neonatal SVZ neurogenesis (4). 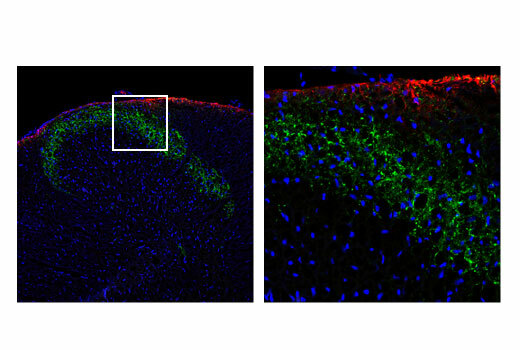 It has recently been shown that neural progenitor cells (NPCs) that overexpress CEND1 display increased neuronal differentiation in a mouse model of brain injury, suggesting its potential use as a therapeutic intervention for neurodegenerative diseases and brain injury (5). Background: Modulation of chromatin structure plays a critical role in the regulation of transcription and replication of the eukaryotic genome. The nucleosome, made up of four core histone proteins (H2A, H2B, H3, and H4), is the primary building block of chromatin. In addition to the growing number of post-translational histone modifications regulating chromatin structure, cells can also exchange canonical histones with variant histones that can directly or indirectly modulate chromatin structure (1). CENP-A, also known as the chromatin-associated protein CSE4 (capping-enzyme suppressor 4-p), is an essential histone H3 variant that replaces canonical histone H3 in centromeric heterochromatin (2). The greatest divergence between CENP-A and canonical histone H3 occurs in the amino-terminal tail of the protein, which binds linker DNA between nucleosomes and facilitates proper folding of centromeric heterochromatin (3). The amino-terminal tail of CENP-A is also required for recruitment of other centromeric proteins (CENP-C, hSMC1, hZW10), proper kinetochore assembly and chromosome segregation during mitosis (4). Additional sequence divergence in the histone fold domain is responsible for correct targeting of CENP-A to the centromere (5). Many of the functions of CENP-A are regulated by phosphorylation (6,7). Aurora A-dependent phosphorylation of CENP-A on Ser7 during prophase is required for proper targeting of Aurora B to the inner centromere in prometaphase, proper kinetochore/microtubule attachment and proper alignment of chromosomes during mitosis (6). 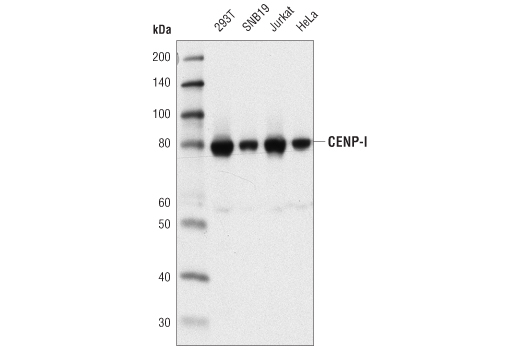 Background: Centromere-associated protein E (CENP-E) is a kinesin-like motor protein and mitotic-checkpoint kinase BUB1B binding partner that is essential for establishing and maintaining stable attachments between mitotic chromosomes and spindle microtubules (1). CENP-E plays an important role as a motor protein in the alignment of chromosomes during prometaphase (2). 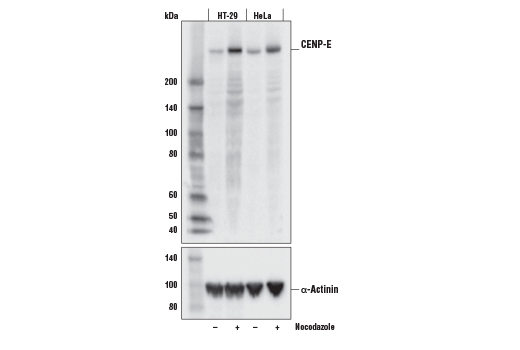 Research studies indicate that CENP-E protein expression peaks in late G2 and M-phases of the cell cycle before the protein is degraded at mitotic exit (3). Additional studies show that the loss of CENP-E function results in cell cycle arrest in mitosis. Mutations in the corresponding CENPE gene can result in autosomal recessive primary microcephaly-13, a developmental disorder characterized by small head circumference, dysmorphic facial features, short stature, and delayed psychomotor development (4). Since CENP-E is essential for mitotic progression and is required for cellular proliferation, it has become an interesting target for cancer therapy (5-7). Background: CENP-F (mitosin), is a kinetochore-associated protein whose expression and localization to chromatin is regulated in a cell cycle-dependent manner, with its highest expression in G2/M phases (1, 2). CENP-F is required for appropriate localization of other kinetocore-associated proteins, including CENP-E. CENP-F regulates kinetocore function and maintenance of the mitotic spindle checkpoint. 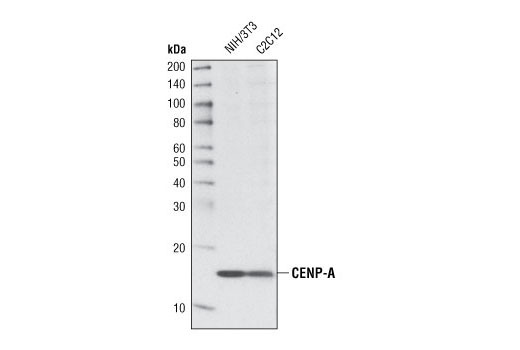 Farnesylation of CENP-F is required for its localization and function (3). CENP-F also interacts with the mitochondrial protein, miro, to direct the distribution of mitochondria to daughter cells as they exit mitosis (4). Researchers have shown that CENP-F drives prostate tumor growth synergistically with FOXM1 in human and mouse (5), and that the gene for CENP-F is among those frequently amplified in hepatocellular, head and neck, and esophageal carcinomas (6-8). CENP-F expression has also been shown in research studies to be associated with poor prognosis in breast cancer (9). Background: Kinetochores are mitotic structures that form on centromeres and attach to mitotic spindle microtubules. Kinetochore attachment to microtubules regulates chromosome segregation and progression through mitosis. Unattached kinetochores signal to the spindle assembly checkpoint (SAC) machinery, arresting cells in mitosis (1).CENP-I is a centromere protein associated with the inner kinetochore, and required for progression through mitosis and the appropriate localization of other kinetochore-associated and checkpoint proteins, including CENP-C, the RZZ complex, MAD1 and MAD2 (2-4). Background: The 55 kDa centrosomal protein (CEP55) is a widely expressed centrosome and midbody-associated protein that regulates cytokinesis, including completion of the final step during cytokinesis known as abscission (1,2). CEP55 activity during abscission is negatively regulated by p53 through Polo-like kinase 1 (3,4). 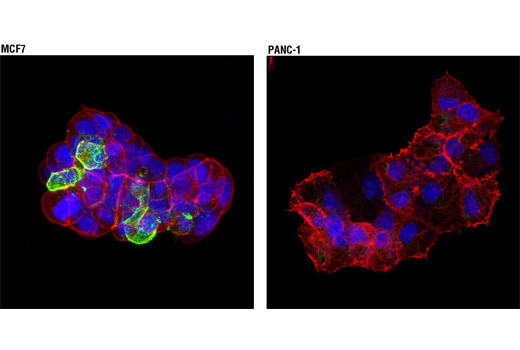 The breast and ovarian cancer DNA repair protein BRCA2 interacts with CEP55 and plays a regulatory role during abscission (5). 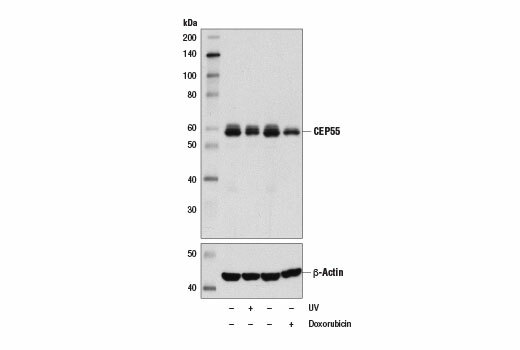 Research studies demonstrate that CEP55 is also involved in the regulation of Akt signaling, autophagy, and may be a biomarker in human cancer (reviewed in 6). The correlated overexpression of CEP55, the transcription factor FoxM1, and the HELLS helicase is seen in head and neck squamous cell carcinoma (7,8). 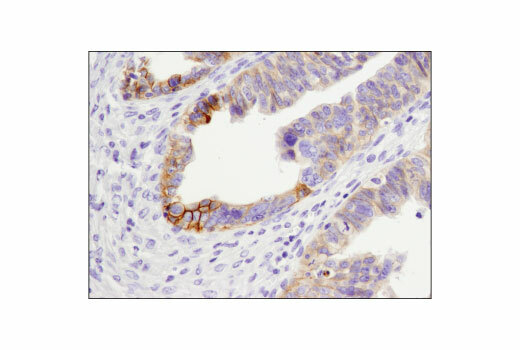 Additional studies demonstrate that CEP55 expression regulates cell proliferation in gastric carcinoma (9). 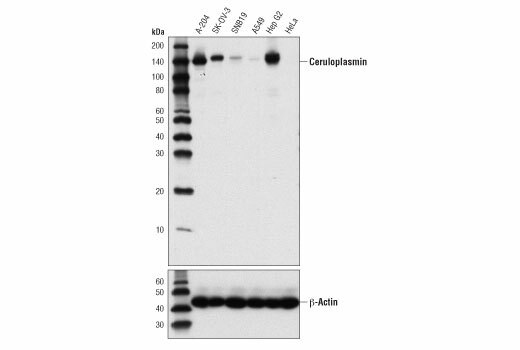 Background: Ceruloplasmin is a copper-binding glycoprotein with ferroxidase activity. It oxidizes Fe2+ to Fe3+, facilitating iron transport across the cell membrane (1). Mutation in Ceruloplasmin causes aceruloplasminemia, an autosomal recessive disorder of iron metabolism characterized by iron accumulation in the brain as well as visceral organs, resulting in retinal degeneration, diabetes mellitus and neurological disturbances (2,3). Ceruloplasmin level in serum has been explored as a diagnostic marker for Wilson disease and ischemic heart disease (4,5). Background: CFTR (ABC35, ABCC7, CBAVD, CF, dj760C5.1, MRP7, TNR-CFTR) is a member of the ATP-binding cassette (ABC) transporter superfamily. Mutations in ABC genes have been linked to many diseases. 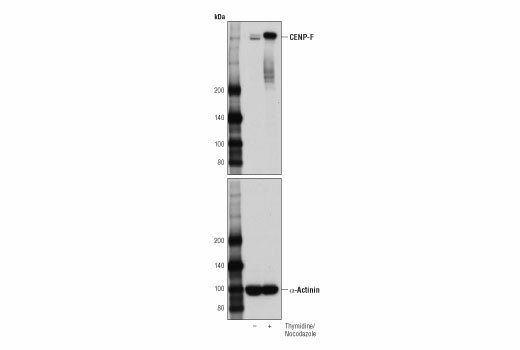 CFTR is a plasma membrane cyclic AMP activated chloride channel that is expressed in the epithelial cells of the lung and several other organs (1,2). It mediates the secretion of Cl- and also regulates several channels including the epithelial sodium channel (ENaC), K+ channels , ATP release mechanisms, anion exchangers, sodium bicarbonate transporters and aquaporin water channels (3,4,5,6,7,8 9,10). Mutations in the CFTR gene cause cystic fibrosis, a disease that is characterized by exocrine pancreatic insufficiency, increase in sweat gland NaCl, male infertility and airway disease (1,2,11). Intracellular trafficking regulates the number of CFTR molecules at the cell surface, which in part regulates Cl- secretion. Deletion of phenylalanine 508 (deltaF508) is the most common mutation in CF patients. This mutation results in retention in the ER, where ER quality control mechanisms target the deltaF508 mutant to the proteosome for degradation (12-14). Therefore, disruption of CFTR trafficking leads to disregulation of Cl- secretion at the plasma membrane of epithelial cells. Background: Cyclic GMP-AMP synthase (cGAS, MB21D1) is an antiviral enzyme that produces the second messenger cyclic-GMP-AMP (cGAMP) in response to cytoplasmic DNA (1,2). 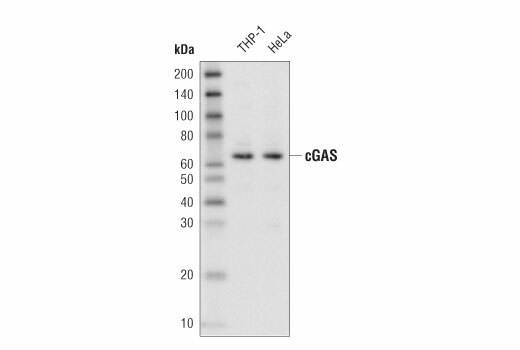 The cGAS protein acts as a cytosolic DNA sensor that binds DNA and produces the cGAMP second messenger from ATP and GTP (1,2). cGAMP binds to and activates STING, a transmembrane adaptor protein that is a critical component of the cellular innate immune response to pathogenic cytoplasmic DNA (1-4). STING is ubiquitously expressed and found predominantly in the ER (3). Following activation, STING translocates with TBK1 to perinuclear endosomes (5). The TBK1 kinase phosphorylates and activates interferon regulatory factors (IRFs) and NF-κB, which leads to the induction of type I interferon and other immune response genes (3-5). 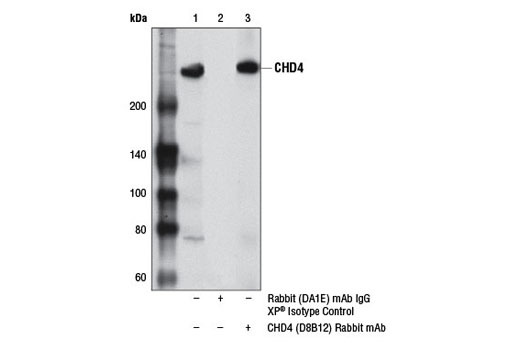 This Cell Signaling Technology antibody is conjugated to biotin under optimal conditions. 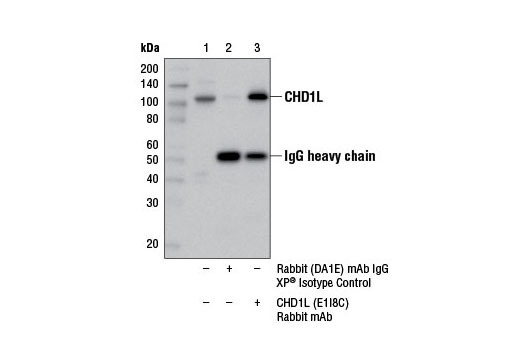 The biotinylated antibody is expected to exhibit the same species cross-reactivity as the unconjugated cGAS (D1D3G) Rabbit mAb #15102. 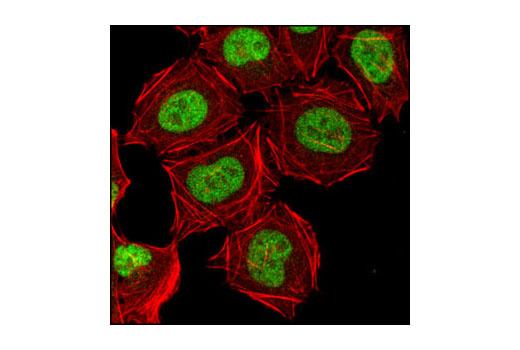 Background: Ch-TOG (colonic hepatic tumor overexpressed gene)/CKAP5 (cytoskeleton-associated protein 5) is a microtubule stabilizing protein involved in the organization of mitotic spindle poles through interaction with the transforming acid coiled-coil protein, TACC3 (1). Ch-TOG and TACC3 also interact with the membrane trafficking protein clathrin, and this interaction is thought to be required for clathrin’s mitotic function in crosslinking microtubules in the mitotic spindle (2). Researchers have found that expression levels of both TACC3 and ch-TOG are correlated with human diseases such as glioblastoma and hepatic carcinoma (3). A genome-wide siRNA screen identified ch-TOG and other G2/M phase regulators as potential contributors to head and neck squamous cell carcinoma (4). Background: Chromatin assembly factor 1 (CAF-1) is a histone H3/H4 chaperone complex that functions in de novo assembly of nucleosomes during DNA replication and nucleotide excision repair (1). Nucleosome assembly is a two-step process, involving initial deposition of a histone H3/H4 tetramer onto DNA, followed by the deposition of a pair of histone H2A/H2B dimers (1). CAF-1 interacts with PCNA and localizes to DNA replication and DNA repair foci, where it functions to assemble newly synthesized histone H3/H4 tetramers onto replicating DNA (2-6). Assembly of histone H2A/H2B dimers requires additional assembly factors. The CAF-1 complex consists of three proteins: CHAF1A (p150), CHAF1B (p60) and RBAP48 (p48 or RBBP4). CHAF1A and CHAF1B proteins are specific for the CAF-1 complex, while RBAP48 is a component of multiple chromatin modifying complexes (1). 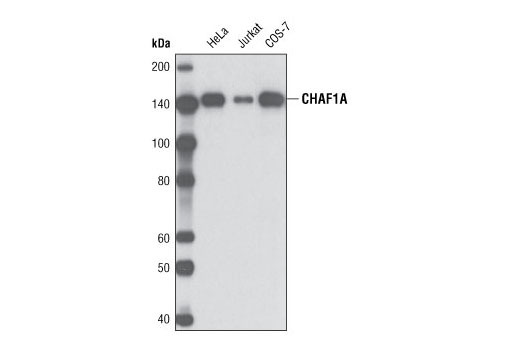 CHAF1A and CHAF1B expression levels correlate with cellular proliferation and both proteins are significantly down-regulated in quiescent cells (7). Background: Chromodomain-helicase-DNA-binding domain (CHD) proteins have been identified in a variety of organisms (1,2). This family of proteins, which consists of nine members, has been divided into three separate subfamilies: subfamily I (CHD1 and CHD2), subfamily II (CHD3 and CHD4), and subfamily III (CHD5, CHD6, CHD7, CHD8, and CHD9). All of the CHD proteins contain two tandem N-terminal chromodomains, a SWI/SNF-related ATPase domain, and a C-terminal DNA binding domain (1,2). The chromodomains facilitate binding to methylated lysine residues of histone proteins and confer interactions with specific regions of chromatin. The SWI/SNF-related ATPase domain utilizes the energy from ATP hydrolysis to modify chromatin structure. CHD1 is a euchromatic protein that associates with the promoters of active genes, and is required for the maintenance of open chromatin and pluripotency in embryonic stem cells (3-6). The two chromodomains of CHD1 facilitate its recruitment to active genes by binding to methyl-lysine 4 of histone H3, a mark associated with transcriptional activation (4-6). 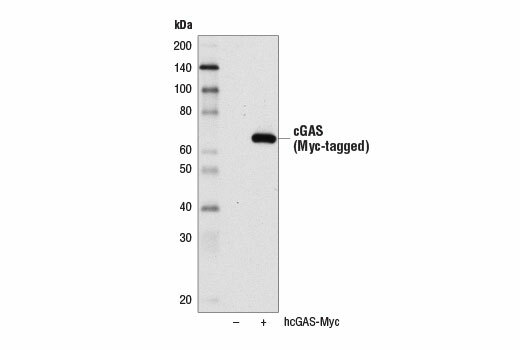 Yeast CHD1 is a component of the SAGA and SLIK histone acetyltransferase complexes, and is believed to link histone methylation with histone acetylation during transcriptional activation (6). 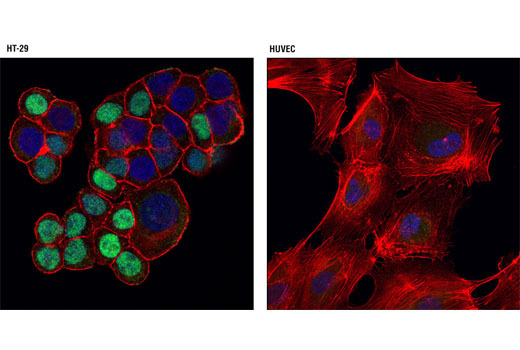 The CHD2 protein is not well characterized; however, mouse knockout studies suggest important functions in development and tumor suppression. 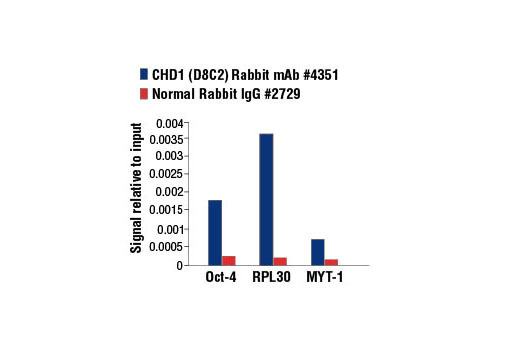 Homozygous CHD2 knockout mice exhibit delayed growth and perinatal lethality (7). Heterozygous knockout mice show increased mortality and gross organ abnormalities, in addition to increased extramedullary hematopoiesis and susceptibility to lymphomas (7,8). CHD2 mutant cells are defective in hematopoietic stem cell differentiation and exhibit aberrant DNA damage responses (8). Background: Chromodomain-helicase-DNA-binding domain 1 like (CHD1L) is a DNA helicase and member of the SNF2 subfamily of ATP dependent chromatin remodeling enzymes (1). Unlike other CHD chromatin remodeling proteins, CHD1L lacks a methylated histone binding chromodomain but does contain a macro domain that binds poly-ADP ribosylated (PARylated) targets (1,2). Following genotoxic stress, CHD1L interacts with PARylated PARP1 and is recruited to sites of DNA damage to facilitate DNA repair (3,4). The CHD1L protein is often over expressed in metastatic hepatocellular carcinoma (HCC) and the corresponding CHD1L gene is located in a region that is frequently amplified in cases of HCC (5-7). Research studies indicate that CHD1L over expression may lead to over relaxation of chromatin and exposing the underlying DNA to genotoxic stress (1). CHD1L can regulate expression of genes that promote tumor cell proliferation, migration and metastasis, providing another mechanism where CHD1L may promote hepatocellular carcinoma progression and metastasis (6,8). Additional research studies suggest that over expression of CHD1L may be involved in the progression of bladder, colon and ovary cancer (9-11). Background: Chromodomain-helicase-DNA-binding domain (CHD) proteins have been identified in a variety of organisms (1,2). This family of nine proteins is divided into three separate subfamilies: subfamily I (CHD1 and CHD2), subfamily II (CHD3 and CHD4), and subfamily III (CHD5, CHD6, CHD7, CHD8, and CHD9). All CHD proteins contain two tandem amino-terminal chromodomains, a SWI/SNF-related ATPase domain, and a carboxy-terminal DNA-binding domain (1,2). The chromodomains facilitate binding to methylated lysine residues of histone proteins and confer interactions with specific regions of chromatin. The SWI/SNF-related ATPase domain utilizes energy from ATP hydrolysis to modify chromatin structure. CHD proteins are often found in large, multiprotein complexes with their transcriptional activation or repression activity governed by other proteins within the complex. CHD3 (also known as Mi2-α) and CHD4 (also known as Mi2-β) are central components of the nucleosome remodeling and histone deacetylase (NuRD) transcriptional repressor complex, which also contains HDAC1, HDAC2, RBAP48, RBAP46, MTA1, MTA2, MTA3, and MBD3 (3-8). Both CHD3 and CHD4 contain two plant homeodomain (PHD) zinc finger domains that bind directly to HDAC1 and HDAC2.